Rates per person per night in a double room start from £136 on a half-board basis. 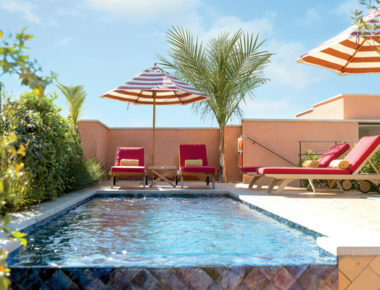 When you think of a resort holiday, the connotations aren’t always positive. Hold up a minute, though, and replace those visions of badly stocked buffets and too many children with a picturesque private village on the north Sardinian coast, designed to fit seamlessly into the natural landscape. That just about sums up Resort Valle dell’Erica, one of eight properties on the island run by Delphina Hotels (which is still a family business, FYI). Think sun, sea and sand – and most importantly, seclusion. 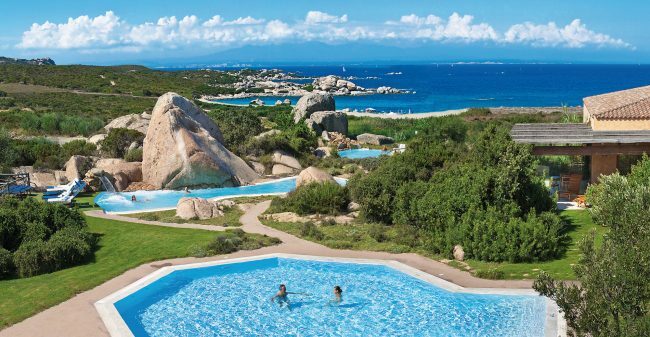 Located right on the coast at Sardinia’s northernmost tip (squint on your terrace and you can see Corsica, that’s how close you are), Valle dell’Erica is an hour’s transfer from Olbia Airport, and you can fly there direct from Gatwick in two hours. 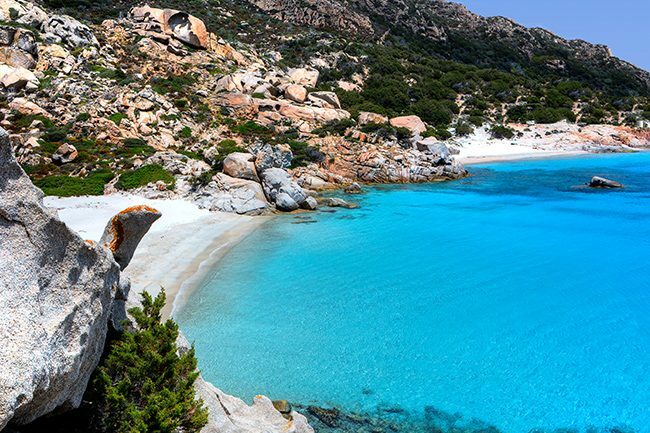 If you have time, drive (or arrange a transfer) to the nearby ancient village of Santa Teresa Gallura, with its beautiful coves and ancient stone or take a boat trip to La Maddalena. 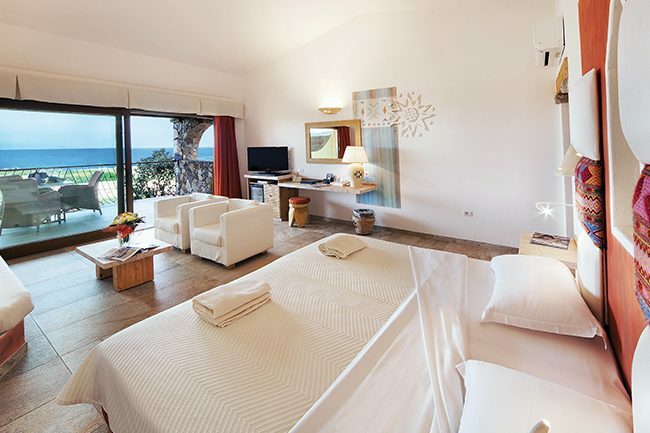 Okay, so Valle dell’Erica is technically a resort, but with 28 square hectares and 1400 metres of coastline to explore, it feels like more of a small coastal village. 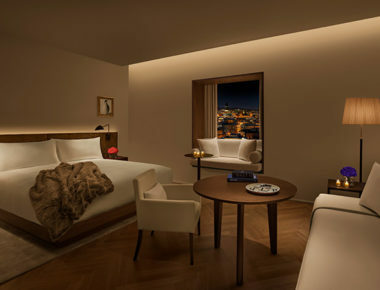 There are two ‘hotels’ you can stay in – Erica or Licciola, with Licciola being the newer of the two. We stayed in Erica, and in keeping with the mini village vibe, our room felt more like a small villa than a single hotel room. Decor-wise, it’s all about traditional Med vibes here – muted palettes, classic iron furnishings and Sardinian rugs – but the focal point of each room in Erica is the outdoor terrace (every room has one) which overlooks the sea. It’s all about enjoying the surrounding landscape here, and the rooms reflect that. So, we’ll say it again for emphasis – the resort is big. You’ll be given a map on arrival, and you can walk around, but if you’re going from one side of the resort to the other, you might want to hail one of the buggies that are driving around for your benefit. 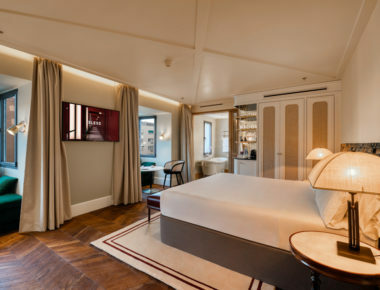 It took us a few days to get to grips with where everything is, but give us a break – there are 271 rooms, four swimming pools, seven restaurants and five bars, seven private bays, a beach and a spa. That might make it sound crowded, but trust us – each area feels completely secluded and almost as if you’re there alone, even in peak season. Normally choosing between buffet or à la carte is easy: always à la carte. 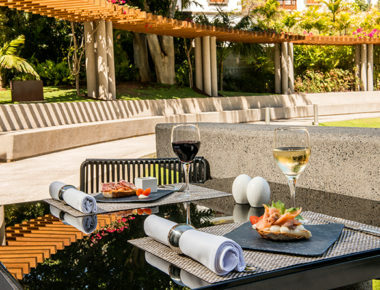 We have to say, though, the three buffet restaurants here (Grecale, Nautilus and Les Bouches) are exceptional, and there’s something for everyone – from dedicated vegan and gluten free sections to daily fresh pasta specials. 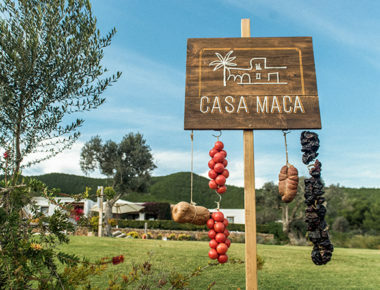 If you do want à la carte, though, we recommend Li Ciusoni, a hilltop restaurant with incredible views and traditional Sardinian suckling pig BBQ. 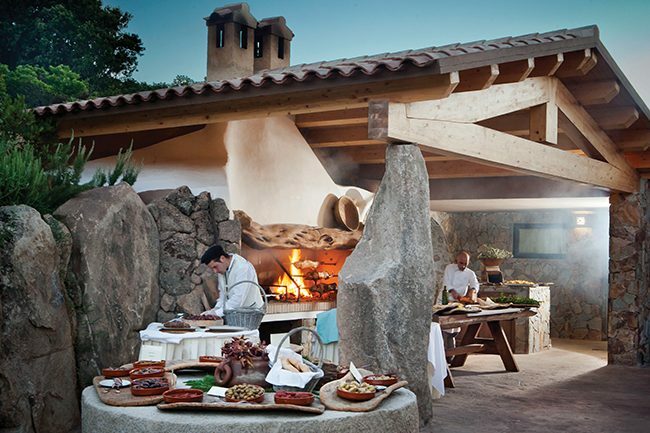 You can also book in for complimentary Sardinian cooking cooking lessons at the outdoor kitchen here. 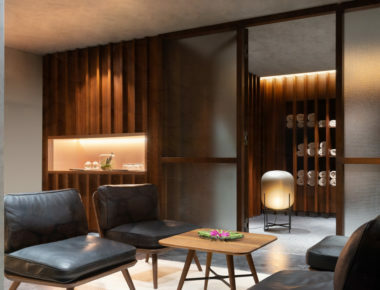 Don’t skip the spa when you’re here – they offer some local treatments that are hard to get elsewhere. Try out the Thalassotherapy pools (which use water from the sea to heal aches and pains), followed by a Sardinian gommage scrub using local herbs and sea salt.